His travels abroad reinforced this longing to be part of an artisan tradition. Many cultures place a high value on craftsmanship and traditional trades, and Jerome was struck by this when he lived in Germany for three years and had the chance to travel extensively throughout Western Europe. In particular, the high quality of European bread attracted his notice. What does it mean that Jerome is an artisan baker? It means that his bread is made with attention and care. Jerome uses the finest ingredients. He begins with a starter rather than yeast. And since he does not bake in an industrial bakery where heat and humidity are controlled, he literally has to be “living in the moment” as he works with the dough. He has to consider how the micro-climate of the kitchen is affecting the bread dough. Being in the moment to produce the highest quality bread reminds Jerome of his childhood. As a kid, he loved gardening. He also learned a lot about baking from his grandmother’s bakery in Pittsburgh. When he visited her, he loved to work with the dough as he learned from her. “It’s a good sense of being,” he says about those tactile tasks. Pick up some of Jerome’s bread the next time you are at Wolff’s. 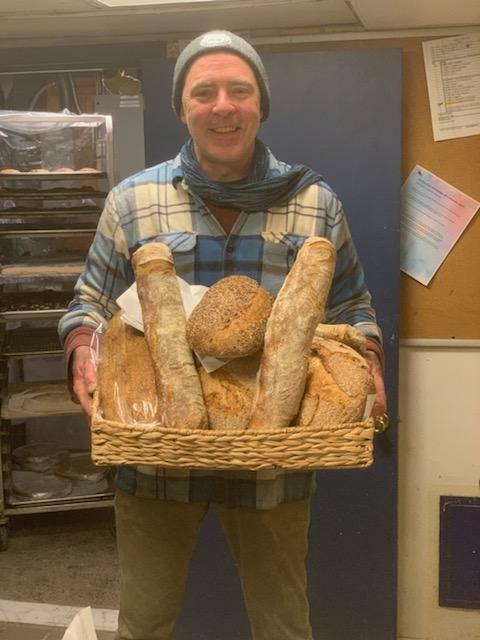 Since it is such a favorite at Wolff’s, you can often find Jerome’s bread being sampled… subscribe to our newsletter to learn what we’re sampling each week. And since Easter is coming up soon, make sure to add Jerome’s bread to your Easter dinner menu!